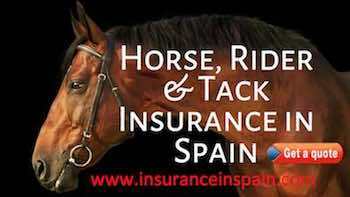 The best Horse Insurance available in Spain, includes, vets fees, Collick, death and horse disposal and more. We cover, horses, riders, ponies & donkeys. You have come to the right place for any form of Horse or Pony Insurance. www.insuranceinspain.com can offer a variety of Horse and Pony insurance products to suit your individual requirements. In addition to the insurance for your Horse or Pony, we can also cover horse-boxes, trailers and third party liability for riders. If you have specific requirements or require any specialised insurance for your horse, please contact us in the first instance on 0034 965 27 57 27 or complete a quote online. Up to the value contracted for the horse. Up to the horse´s value. * In case of an incident covered by the policy, round trip transportation is included up to 150Kms, as long as it is made and approved by the contracted insurance company. You will often see horses or ponies pulling a beautifully decorated carriage on the Spanish roads. Some are old work carts that are used to collect oranges or crops from the fields when old traditional methods are used. Nowadays these horse and cart combinations are used fro weddings and many other events. We do insure them with a third party liability so if you have a horse and want to pull a cart as well, we have the perfect insurance for you. For further information please contact www.insuranceinspain.com on 965 27 57 27 or complete the quote application form on our website www.insuranceinspain.com, request a call back or e.mail us at info@insuranceinspain.com. An well established (1993) horse trekking and horse riding centre based in the heart of Andalucia, Spain. They offer unique horse riding holidays in Spain. They are situated on a plateau at a height of 1200 meters above the spa town of Lanjaron in the Alpujarra region of Andalucia.